Gary LaFree to speak on terrorism's challenges to policymakers START Director and Professor of Criminology and Criminal Justice Gary LaFree will speak on "Black Swans and Burstiness: Countering Myths about Terrorism" as part of the University of Maryland's Distinguished Scholar-Teacher Program. LaFree's lecture will be held on Thursday, Oct. 4 at 4 p.m. in the Prince George's Room in Stamp Student Union. The event is free and open to the public and a reception will follow, but an RSVP should be made to infostart@start.umd.edu. LaFree's lecture will explore the dichotomous nature of terrorism; its black swan quality and its burstiness, and how those characteristics pose unique challenges for public policy makers. 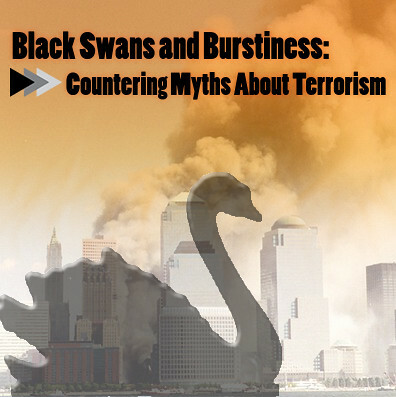 Black swan incidents are those high-impact events that defy expectation and prediction, such as the coordinated attacks against the United States on September 11, 2001. Burstiness refers to how terrorism incidents tend to be highly concentrated in time and space. LaFree will discuss that, in stark contrast to the 9/11 attacks, many terrorist attacks: produce no fatalities; frequently rely on common, low technology weapons; do not involve a great deal of planning; and are carried out by groups whose life expectancy is less than a year. LaFree was named one of the University of Maryland's Distinguished Scholar-Teachers for the 2012-2013 academic year. The Distinguished Scholar-Teacher award recognizes tenured faculty members who demonstrate excellence in teaching in their field as well as noteworthy scholarly accomplishments in their field. LaFree is one of three faculty members from the Department of Criminology and Criminal Justice to receive the award since its creation. LaFree serves as the director of the National Consortium for the Study of Terrorism and Responses to Terrorism (START) and played an integral role in creating the Global Terrorism Database, the most extensive unclassified database of terrorism incidents in the world. LaFree also helped to create the Terrorism Studies Minor at the University of Maryland and has facilitated hundreds of internships for students at START.